Your doctor’s office will handle all admission arrangements and will probably tell you when and what time to arrive at the hospital. It’s also possible that you will receive a call from the hospital to verify your specific admission time. Prior to admission, a UMHS representative may contact you to obtain information about insurance benefits or other payment arrangements. If your insurance requires pre-certification before admission, be sure to let your doctor's office know so arrangements can be made in a timely manner. UMHS staff may notify you before admission about any portion of your bill that will not be covered by your insurance. In that case, a deposit will be required upon admission for the amount not covered by insurance. Check in when you arrive at the hospital, even if your doctor or doctor's office has told you otherwise. During check-in, you will be asked to sign a patient consent form. Then, once your room is ready, you will be able to settle in. The University of Michigan Health System welcomes the presence of loved ones because we know how important it is for their healing to family and friends with them during hospitalization, and we know that informed family members lead to better outcomes for patients. Read more about how your family and loved ones can be involved in your care. If, prior to admission, you have a temperature, runny nose or cough; have been exposed recently to mumps, measles, chicken pox or rubella; have vomiting, diarrhea or a rash; or have symptoms you feel would inhibit treatment, please contact your admitting physician before coming to the hospital. Any of these symptoms may result in canceling the admission, and a phone call could prevent an unnecessary trip. A patient may be called three days before an appointment to pre-register on the phone. If you are pre-registered, you do not need to go through the registration process on the day of your visit, but you will still need to check in. Your U-M blue hospital registration card if you have one. If you don’t have one, you will get one when you’re here. A list of over-the-counter and prescription medications you have recently, or are currently, taking. Be sure to include the medication names, dosage amounts and number of times taken. Please do not bring in the medications themselves. They will be sent home or stored in Security. A phone card to use when making long-distance calls. Please feel free to bring any toiletry items from home that would make your stay more comfortable. There are basic toiletries available, if needed. We discourage patients from bringing along personal electronic devices such as laptops, iPods, MP3 players, etc., because there are times when you will not be in your room and will not be able to secure them properly. If you do bring the items, please clearly label them with your name and information. UMHS is not responsible for loss of such items. If you are using an MP3 player, video game or laptop with sound, please make sure to bring and use headphones to help us maintain an environment that is respectful to all patients and visitors. Please leave valuables (i.e., jewelry, large sums of money, computers, etc.) at home. The hospital cannot assume responsibility for lost or misplaced valuables. If you must bring any of these items, we ask that you place them in the hospital safe for the duration of your stay. Credit cards should be secured on your person at all times. Please do not bring your medications. Instead, bring a list of all medications you are taking. Please do not bring belts, anything with a cord, including clothing with a drawstring, a walkman or tapes, or anything made of glass. Sharp items of any kind are not allowed. Please do not bring drugs, alcohol, cigarettes, lighters, matches, chewing tobacco, medications (unless requested by your doctor), razors, weapons, tape recorders, televisions, computers or cameras. Please limit yourself to one suitcase. Pack casual and comfortable clothes for a three-to five-day stay. There are washers and dryers on the unit and soap is provided. 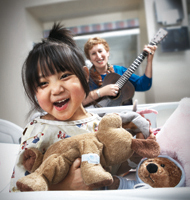 Mott Children's Hospital has its own guide for inpatient stays for pediatric patients. We prepare healthful and nutritious food, and our registered dieticians and dietary technicians make sure food is in keeping with the patient's medical condition, treatment plan, and individual preferences. Religious dietary concerns are also addressed; please talk with your nurse if you have questions. Follow this link to the Food and Nutrition while in the hospital webpage. To request all services, call at 734-936-ARTS (2787) or email GOA@med.umich.edu. Phones are staffed Monday-Friday, 8:30 am-4:30 pm. Message requests left after hours and on weekends will be picked up the next business day. The Art Cart is a lending library of framed poster art. 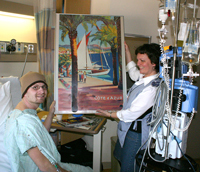 Volunteers take two colorful carts of posters to inpatients so they can select the art for their rooms. The simple choice of artwork is one way we try to give patients a sense of control at a time when so much is decided for them. The Art Cart visits all inpatients at U-M hospitals except those in Intensive or Moderate Care Units. With Bedside Art, specially-trained artists visit patients with complementary art making kits and the Art Gallery Coloring Book. All supplies are provided. This program is currently staffed on Mondays and Fridays (subject to change), so visits or deliveries can only happen on those days. Certified music practitioners provide Bedside Music in most patient units, intensive care units (ICUs), neonatal units, and dialysis, burn / trauma, and pre- and post-surgery areas. Music has an almost immediate stress-reducing and calming effect on patients. To request a visit by a bedside musician, you may use the contact information above, ask a nurse to request Bedside Music on CareLink, or use the paging system by calling 734-936-6266 and entering ID 31399 at the prompt. See Entertainment & the Arts for other Gifts of Art programs that inpatients may be able to take advantage of, such as exhibit galleries, public performances, and the Friends Meditation Garden. UMHS is not responsible for the loss of a laptop or other electronic devices. We participate in Therapaws of Michigan, which sends calm, well-behaved therapy dogs and their human companions to visit patients and families in the hospital. Please note that dogs are thoroughly bathed and groomed before they come to U-M for visits. Our C.S. Mott Children's Hospitalis a favorite place for these visits. Visit the Therapaws of Michigansite for more information.